We asked Business Management (Entrepreneurship) student, Marine Tooh, about her placement year. What did you do in your day-to-day work? I was part of the Talent Learning area within the HR department. There were various projects being assigned that spread across the entire year, based on ‘stretch’ projects and your capacity. Bearing in mind the daily workload does varies on a daily basis. Being assigned projects with different learning objectives really sets me off a steep learning curve! Projects span across different levels of difficulty, from organising a learning campaign* to implementing new learning features on the employee online platform, to being on the other side of the recruitment process as an interviewer. 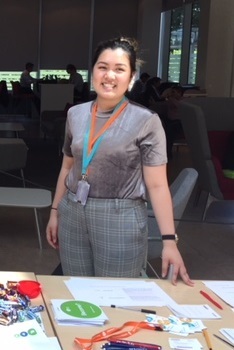 As part of the apprenticeship project team where I was responsible as the point of contact with the GSK apprentices and logistic execution** of the various development workshop and meetings. Projects are assigned based on your interest and the aim to stretch you to reach your fullest potential! I had the chance to present my ideas to the university brand team on the attraction strategy, allowing me to gain valuable feedback. When I’m not on my desk checking emails and doing work, I’m probably attending various meetings and many trips to the pantry! What were the placement highlights? There are so many! One of the major highlights is being part of a 7-month preparation for the Learning campaign being rolled out to the entire organisation globally. I was personally in-charge of managing it for the site I was based at, and also all of the communications, co-hosting the global online call and logistics! It was definitely challenging and daunting to manage so many stakeholders at once, not forgetting being able to apply some of the theories learnt from the HR and marketing modules I took. Others highlights include trips to other GSK sites such as the R&D and manufacturing sites to witness all the action first hand; the consumer products and vaccines that GSK produces that puts the work done at the Headquarters into perspectives and being proud of what we do. Not forgetting there were quite a handful of social events organised throughout the year that allows you to socialize outside work and have fun! I got to meet so many different people and fellow placement students from different universities! It definitely expanded my professional network and build my confidence in the process! How did you get your CV ready and prepare for your interviews? I am very grateful that there is a module during my first year of study called ‘Business Skills’ (to all fellow business students, please don’t disregard and make good use of the module!) It helped me a fair bit in the initial preparation on how to better present your written applications professionally. It will be wise to definitely get your CV checked by the Employability & Careers Centre before sending your application off, which I did! What advice can you give on how to stand out from the competition? Be prepared. Experience counts. It’s not always easy, hence don’t be disappointed if you were unsuccessful in your initial applications. You will only get better at it and excel! Any advice for students wishing to apply for GSK roles? It is such an amazing company with a strong mission and values. Do your research properly and if it what the company does aligns with you, go for it!! Apply early, applications are screened on an ongoing basis and places on the assessment centre are filled as and when candidates meet the criteria. There are so many different opportunities available within GSK, it’s not just for scientists, there’s a great quiz on gsk.com to help you find the area that’s right for you. *The learning campaign is an annual learning initiative called ‘Learning at Work week’, that aims to promotes self- learning tools and resources available within the company to all employees during a week itself. I was part of many the initial meetings of the implementation process of the projects that allows me to fundamentally witness the entire work process from start to end. **By logistic execution – it will include managing the room bookings, transportation, accommodation for the apprentices, including attending the workshops alongside with my team and even facilitating a 30 min MBTI session as part of the apprentices self-discovery session!